Sometimes you got to access devices that are behind a firewall or protected networks. You could do that via VPNs etc. You can also use Yaler, that requires minmal setup! All it takes is a few lines of code make your embedded system or mobile device accessible behind a firewall, a NAT or a mobile network gateway! It can allow you to monitor and remote control devices from any web browser over Reverse HTTP. It is a simple relay infrastructure based on Linden Lab’s Reverse HTTP. Yaler just reverses the connection and forwards the request to you via the Yaler REST API. It has been engineered for high performance, maintainability, robustness and is implemented with Java’s non-blocking sockets, hierarchical state machines, and Design by Contract. 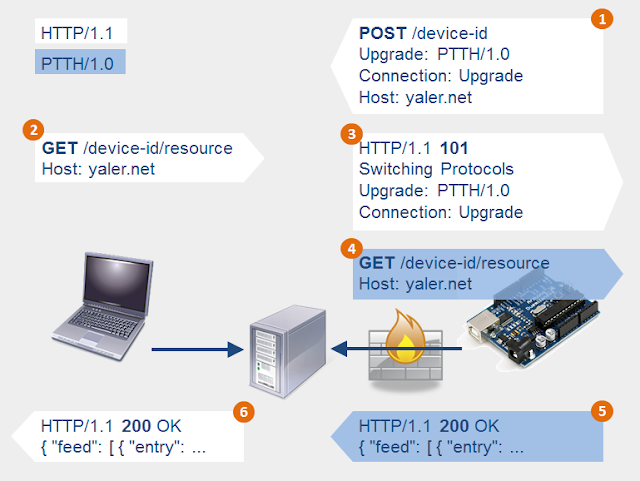 The Yaler relay infrastructure allows a device to publish (step 1) itself under a unique name, e.g. device-id. Whenever a Web client tries to access (step 2) a resource on the device, Yaler asks the device to switch (step 3) to Reverse HTTP, and forwards (step 4) the client request. After processing the request, the device responds (step 5) and Yaler returns (step 6) the response back to the client. In short it aims to provide a simple, open and scalable relay infrastructure for remotely connected devices. All of this in a nifty little open source application! If you are not interested in setting up this architecture and would like to check the service out first, you can also download YalerTunnel that provides a generic tunneling via the Yaler relay infrastructure.